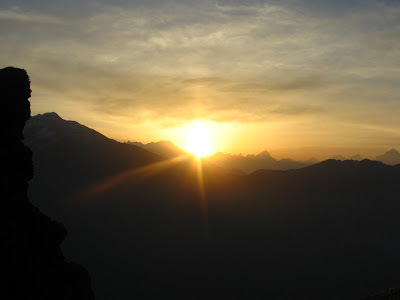 Everyone woke up around 5 and trek 0.5Km to Chandrashila for the most majestic sunrise. I was just not able to get out of the blanket…. Just kept sleeping. These guys came back with rave reviews about what they saw…. I guess I missed this bit….. 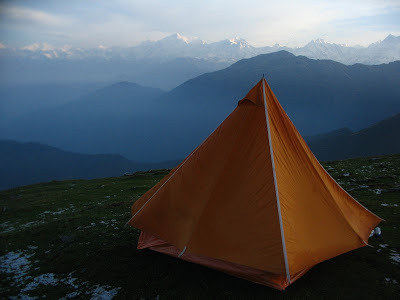 This was the tent which saved us from the hail storm…. And this one saved Vivek sir and Puneet Makkar. 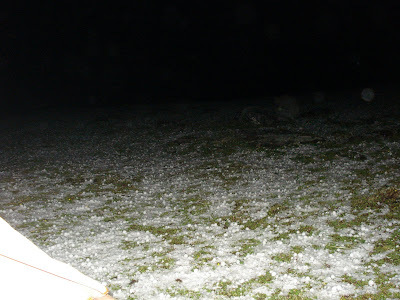 Remnants of the hail storm…..
After coming down, we packed the stuff back in the car and began our drive back….. Most of it was great….. did great timing…. 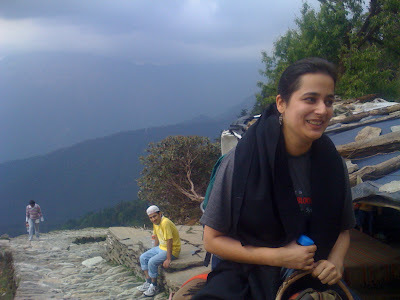 The statutory vomiting session in the hills did happen….. hats off to the group for going out with me even after knowing that I get sick in the hills…. 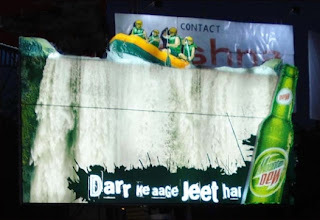 Reached Haridwar in time…. n then started the ordeal on the road….. Asaramji was visiting and and all the roads till Roorkee were completely jammed…. Thankfully there was police force deployed on the way else we would have been doomed till the morning…. Mad hatter and Vivek had to bear the brunt of driving in this almost stagnant traffic…..
We reached Noida back at 4:40am….. I have to really admire this group of people where we worked like a team… we had disagreements but were able to sort them out in a complete Win-Win….. there were different agendas at strake but still everyone was able to do what they had set out to do….. Some people were faster and people like me slower during the trek…. I like to eat this… I don’t like to eat this….. I want to go here… I want to go there….. I want to stay longer… I don’t want to stay here anymore….. I want to sit in the corner…. So do I……. 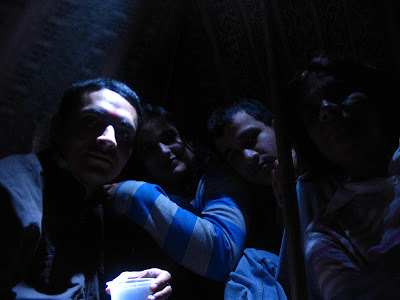 Yet the group was able to accommodate all this happily…. And achieve what each one set out to do. 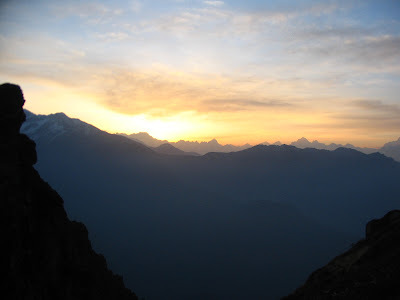 People generally do this trekking trip in 7 days http://www.thehimalayanadventures.com/chadershilla-peak.htm…. We did it in 3 days…… aren’t we now suppose to all be called Mad Hatters to get into this…..
We had some rajma-chawal for lunch. 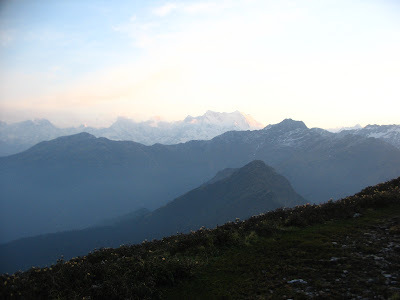 We looked for porters to carry our tents etc up to Tunganath. 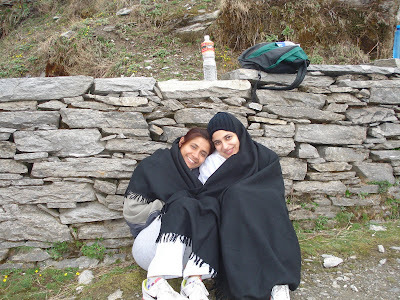 Thus began our most difficult journey….. A 3.5 Km trek at an incline of some 45 degrees… with even rarer air than Deveria Tal….. Water… Chocolate…. 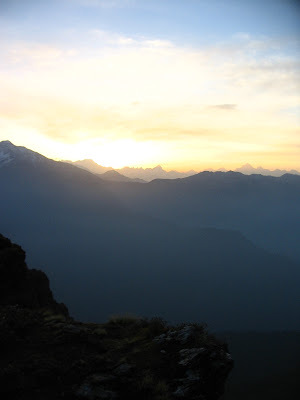 The feeling that my lungs will burst for the want of oxygen…. This can be counted as one of the craziest moves of my life….. which in hindsight was quite an achievement…. In the meantime, Mr Mad Hatter was going up leaps and bounds like a bundle of nuclear energy with the porters….. 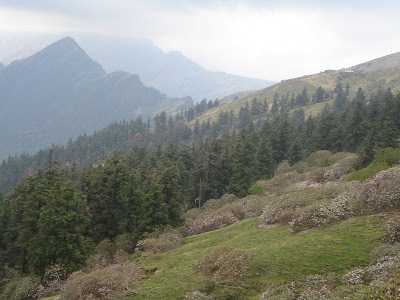 The view was just beautiful… there were these shrubs with pink flowers…. After about 2.5Kms, I just wasn’t being able to deal with it anymore… saw some horse coming down empty…. 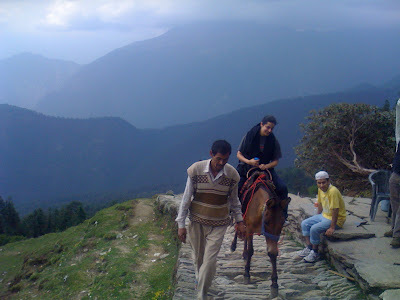 Swallowing my pride, I decided to do the rest of climb on a pony…. Yes, there are pictures….. 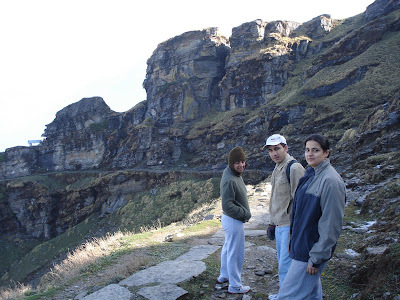 I was scared stiff as the path was made of cobbled stones, so steep and uneven….. reached the top somehow and waited for the others. 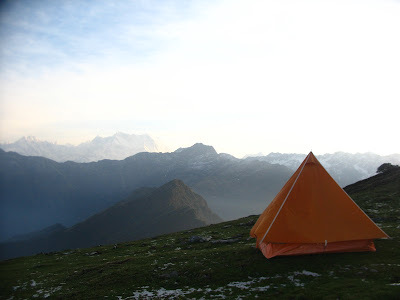 By the time they joined us… Mr Mad Hatter walked another 30 minutes towards the hill top and decided that we should camp there in the wilderness instead of at a regular camp site…. 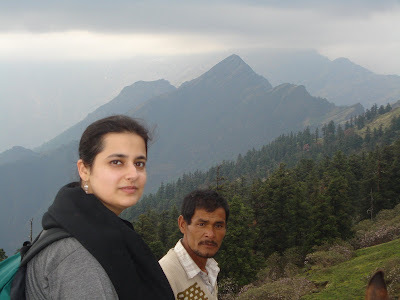 Puneet Makkar, Julie and I were waiting for them near the temple… Icy winds started blowing with a slight drizzle and the porters had all our bags…. We were freezing. 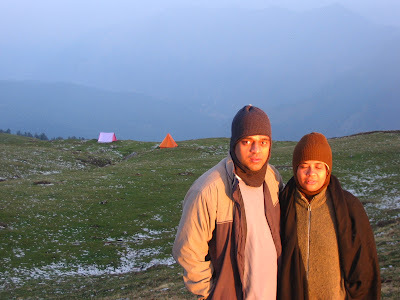 My hands were almost blue with cold… Thankfully I had 1 of my bags with me which had some woolens which we put on. 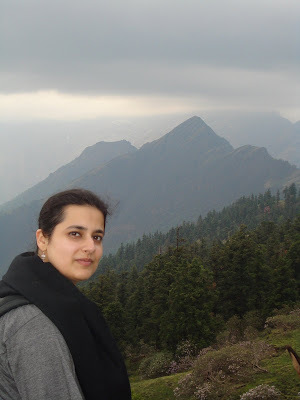 Would like to express my absolute and complete gratitude to my mom for putting in my windsheeter and woolen gloves(Puneet Makkar survived due to them.. ) We sat huddled in the leeward side of the curve cursing Mr Mad Hatter …. We decided to walk back to the temple area, where there were some rudimentary shacks, atleast we’d be out of the icy cold winds. All the while saying it was a stupid idea to camp on top of the hill. Mr Mad Hatter sent a porter down to call us up. 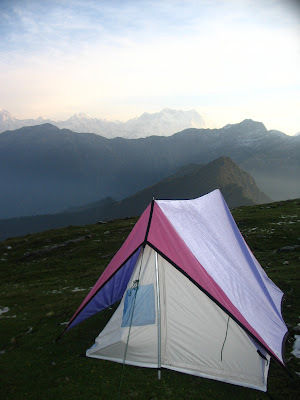 We had to go, as the tents were all set up…. Who would get all that stuff down. Mr Mad Hatter showed no signs of slowing down. We walked up another 30 minutes. 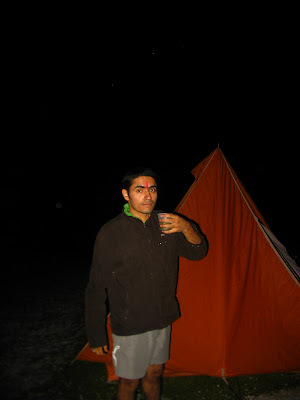 Reached the tents at 6pm. Settled in…. 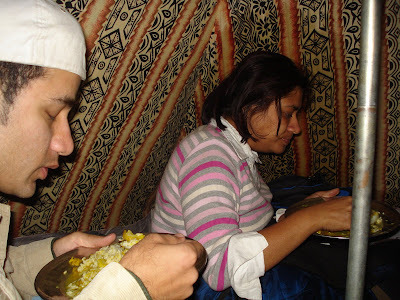 opened our sleeping bags and huddled into them for warmth as we couldn’t do a camp fire as there wasn’t any wood available. The porter got us the dinner from the shacks below. 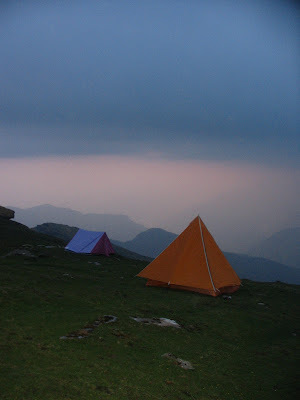 We kept it in our tents and slept was a while till 9pm as all of us were bone tired…. I slept like a LOG. Mom has to be thanked again for insisting that I took a blanket and sheet inside my sleeping bag. Others were hardly getting any sleep as the winds were howling outside and rain was pouring. Everyone was so fearful that the tents would fly away. Thankfully they were worth their salt and all was well. We opened the tent flap only to see the hill full of hail. 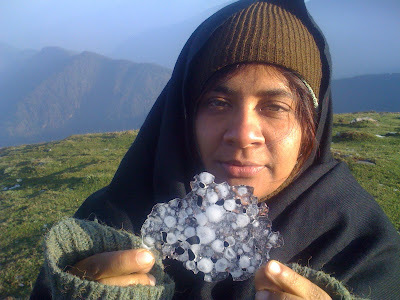 There was such a hailstorm that the entire mountain top was covered in ice…..
Now you know why I call him MAD Hatter…. Everyone had dinner. 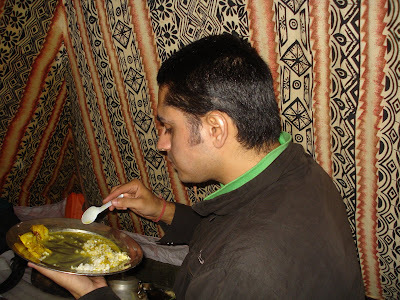 There was dal, chawal and aaloo. Mr Mad Hatter, he was still roaming around in SHORTS… aint he crazy. 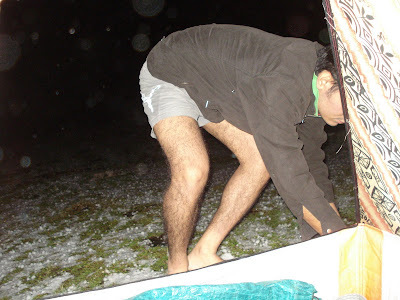 Here I was in 2 T-Shirts, 2 Track Pants, 2 Socks and in a blanketed sleeping bag…… n he is in SHORTS…. 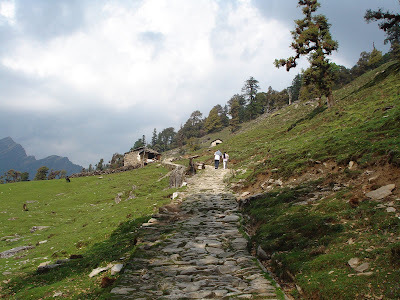 Drive to sari village - Trek to Deveria Tal –– Drive to Chopta (30Kms) - Trek to the shiva temple of TUNGANATH. We woke up to the most delightfully clear day after a misty shower of rain at 7am. We were all click happy and took lots of pictures. The snow capped peaks looked beautiful. We got ready, the thing to report is that the boys took so long to get ready…… We started chomping on biscuits right there…. There was this shrub in full bloom which caught our fancy… actually more than that….. check out the walls at the back…..
That’s Mad hatter and me…. Everyone else had yummy breakfast. 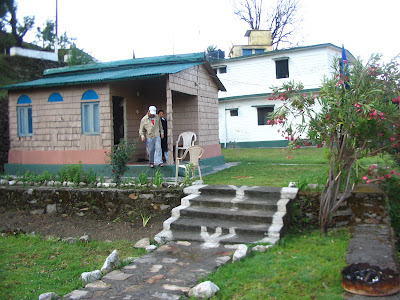 I had the paratha’s packed as we still had to drive some distance in the hills before we left for Chopta for treking. 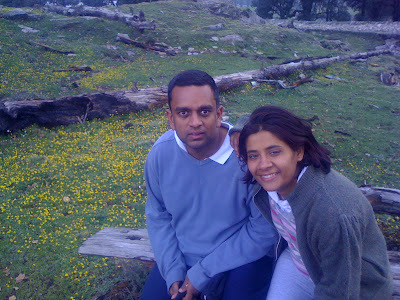 While driving to chopta, we crossed a board which mentioned a detour to Deveria Tal. A lake situated at an altitude of 3200 mts. Legends says its the same lake where Yaksha ask question from Pandavas . 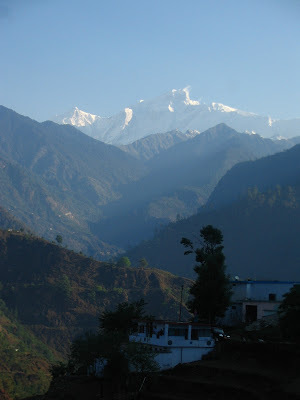 One can see the reflection of Chaukhamba peaks on a bright sunny day. 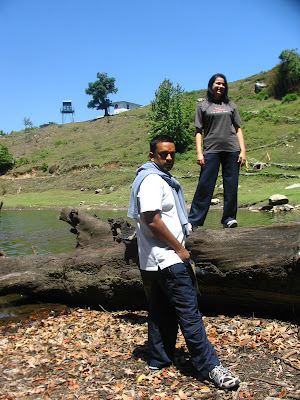 It was decided that lets check out the lake and then we’ll do the Tunganath trek in the afternoon and reach the top by the evening. 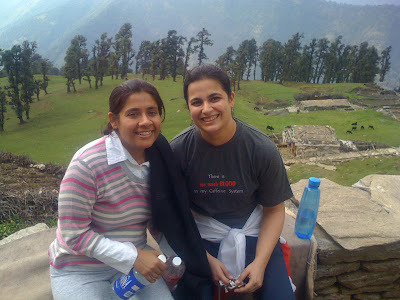 We started the trek with great enthusiasm….. 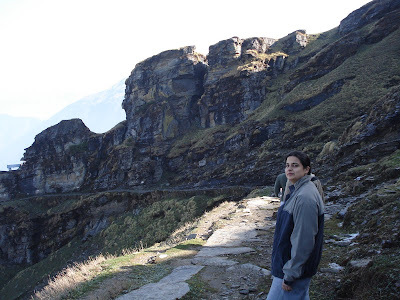 The scenery was great…. 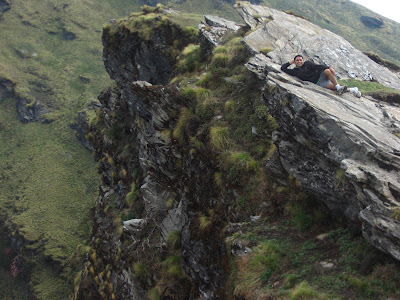 Looking down was giving me the jitters….. just kept going. I never imaged it would be so tough to walk when the air got rare. I was breathing like a fish in no time. Even carrying a full bottle of water was impossible. We split 1 full bottle into 2 halfs. We stopped half way and rested our feet a bit… clicked some pictures…..
Puneet Makkar and Mad Hatter bounded up leaving Julie and me trailing with Vivek sir accompanying us…..
Vivek sir pipes up suddenly… chalo nachi chalo….. abb sirf project ke bugs regress hone baki hai….. the worst is over…. We’re almost there…. Just little bit more….. 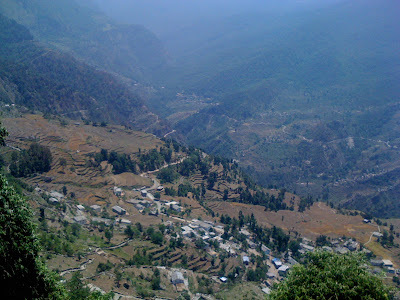 When we reached up….. the view was just fabulous… See for your self…… we were really click happy. This one is a classic…. While walking around the lake on a trailer… I was busy chattering away and looking at the millions of tadpoles in the lake and….WHAM….. walked straight into a tree whose trunk was all knotted up and jutting out…. Ouch… That REALLLLLLYYYY hurt…. This was taken just after the bump…. The climb down was not so tedious as the climb up… but nevertheless very tiring and the calf muscles were complaining a lot. 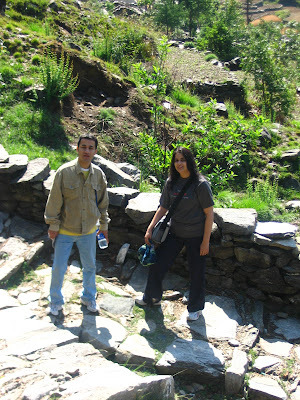 After we reached the village, we sat in the car and drove to Chopta.